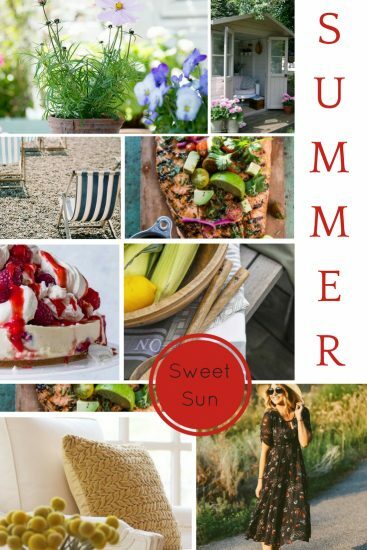 After this endless winter, I think we could all do with a bit of summer sunshine so we have put together a little summer mood board. We love everything that summer has to offer. Not just the potentially great weather but also the food, colours and flowers. Food comes in all forms during the summer months. From fresh crispy salads to barbequed meats and fish and even to fresh desserts, it’s such a delicious few months. Some of our favourites are featured in the mood board above. Just look at that gorgeous salmon! The colours are also a favourite of ours this time of year. All the bright colours come out to play and look so fresh and vibrant in the abundance of natural light. Not to mention the garden coming into its own. This is the time of huge blooms, armfuls of wildflowers, birds flitting from tree to tree and summer houses being dusted and brought back out from hibernation.